1: The word "Maybe" leaves my mouth but the word "Yes" ends up in the children's ears. 2: The sign language for 'Lesbian' and 'Dickhead' from Girl 2. (Though I'm not sure that it is proper sign language or that I will have the opportunity to use it or if I did use it, whether I would get punched in the face or not). 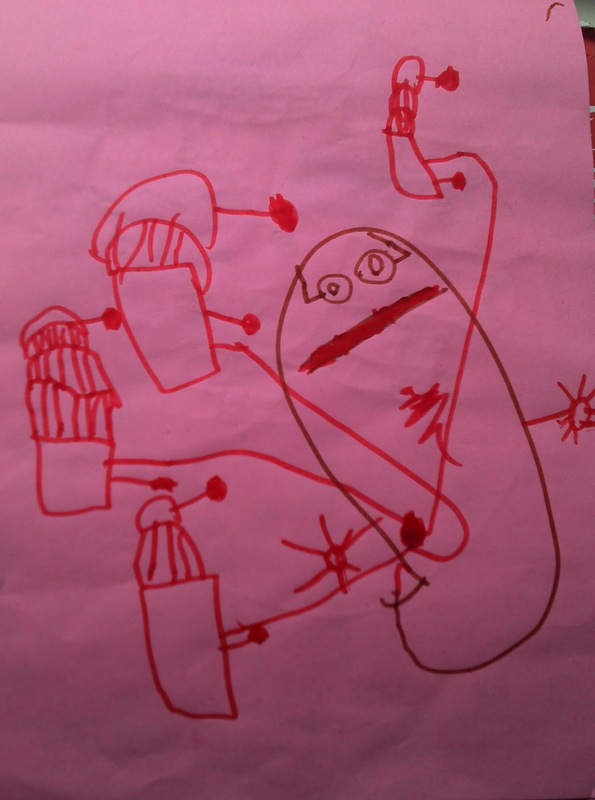 Daleks Killing a Human Bean by Oliver, aged 5. 4: That when they put the word Zero on a drinks can/ bottle they don't just mean zero sugar, they mean zero taste and zero appeal and zero taste. Did I mention zero taste. Yes I'm looking at you Fanta Zero Icy Lemon. 5: I WILL mix gin with anything if we've run out of tonic. Yes I'm looking at you Fanta Zero Icy Lemon. *Slurp* *Grimace* *Slurp* *Grimace* etc.